Russ DiGilio, founder and owner of Duck Donuts Franchising Company LLC, has selected the beach town of Avalon, New Jersey, as the second Garden State site of his nationally celebrated donut franchise. Growing up, I spent my summers in Avalon where my parents lived. Avalon is a place where families make memories, and Duck Donuts is excited to be a new memory-making destination. Dubbed the “chicest beach” in the mid-Atlantic by the Washingtonian, Avalon is located on Seven Mile Island in Cape May County. “Along with area residents, Duck Donut lovers across the nation can enjoy our warm, delicious, made-to-order donut experience when visiting or vacationing in Avalon,” says DiGilio. Only a short distance from the beach, the Avalon location is prominently situated on Dune Drive between 32nd and 33rd streets. The new donut shop will open in the former Comcast building, across the street from the U.S. Post Office. Renovations are scheduled to be complete in May 2016 with a Grand Opening slated for Memorial Day Weekend. “With roots along the Atlantic coastline, Duck Donuts is a family establishment focused on bringing custom donut creations to families across America. Avalon, a community fueled by family and small businesses, is a natural fit for us. Lynda is excited to be a valuable addition to the Avalon Chamber and the business community,” DiGilio says. The Cape May County location is the 26th store in the Duck Donuts enterprise and will include a 1,260 SF Duck Donuts retail store with indoor and outdoor seating. Donuts are made fresh to order seven days a week. For Grand Opening specials, hours of operation, and donut topping updates, visit the Duck Donuts Avalon Facebook page and connect with us on the web at http://www.DuckDonuts.com. 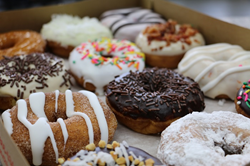 By 2011, Duck Donuts had expanded to four Outer Banks locations and the donut business was so successful that DiGilio was continuously approached about franchise opportunities and by fans who begged for a Duck Donuts in their communities. The first franchise opened in Williamsburg, VA, in 2013 and there are now over 25 open franchise locations. Children love to stand on the strategically placed step in the waiting area, allowing them to see the entire process, as the donut machine cooks and carries their donuts down the line, where they are dipped, topped, packaged, and served warm in the box. Duck Donuts serves its own signature coffee blends—Riptide Roast, Light House Blend, and Sunset Pier Decaf with new special seasonal flavors changing throughout the year—and offers breakfast options, as well as catering services at most locations. Indoor and outdoor seating is available at most locations. For customers who don’t yet have a location in their neighborhood, or wish to gift a delicious box of Duck Donuts to someone far away, order specialty “Flash Frozen” donuts at http://www.DuckDonuts.com.